What is discipleship? It may seem an unexpected question, coming from a church member, but it’s a good one. We’ve grown so accustomed to the church’s jargon, we often use words casually even when we don’t know what they mean. Even when we understand their meanings, we often don’t undertake their challenges. I confess there are moments when I pull back from the challenge. Discipleship, I think, is one of those words. Garrison Keillor observed that sitting in church doesn’t make you a Christian any more than sitting in a garage makes you an automobile. Well, neither does being a member of the church make you a disciple of Christ, nor does it lead to the kind of life church members might be hoping for and that Jesus said he came to offer, the “more and better life than [you] ever dreamed of” (John 10:10 The Message). “Not everyone who says to me ‘Lord, Lord,’ will enter the kingdom of heaven,” he said, putting on notice those who think that claiming the name “Christian” will secure their entry into God’s reign, “but only the one who does the will of my Father in heaven” (Matt. 7:21). In one of his best known and most controversial sermons, John Wesley drew a distinction between people, even apparently good church members, who are “almost Christian” and those who are “altogether Christian.”1 It’s a distinction that still today can drive respected church members to apoplexy. The “almost Christian” – and I wonder if the term describes me – is that person who can be an active and respected member of the church. His life can have the appearance of personal piety, and he can be actively engaged in working for social justice. She and her family can live a modest and simple life, and she can be generous in showing kindness to others, especially those most in need. The “almost Christian” may pray and follow every rule and leave no good deed undone and still be far from the kingdom of heaven, like the rich young man who obeyed all the commandments of God but could not take the last defining step to be a disciple of Jesus (Mark 10:17-22). Discipleship is the process by which one becomes an “altogether Christian,” one who lives that more and better life than we ever dreamed of and who will never again be thirsty for it (John 4:14). Disciples are those for whom the darkness of life is dispelled and who walk in the light of life (John 8:12). Disciples are those who eat their fill of the best life has to offer so they never hunger for it again (John 6:27). How can I be a disciple like that? The starting place, I think, is desperation. Discipleship begins with desperation. “Come to me,” Jesus said, “all you that are weary and are carrying heavy burdens, and I will give you rest” (Matt. 11:28). To pay the price of discipleship – and the price is high; the price is your whole life – you’ve got to be desperate for relief from the burden you’re carrying in life. Not relief from the burden of hard work – the work of discipleship is as hard as any you’ll know – but relief from the burden of meaninglessness, relief from the burden of emptiness, relief from the burden of an inconsequential life. Thirty-five years ago I had a good career in publishing; I was an executive with a scholarly publisher, and I had a bright future in the university. But I was hungry. I felt my life was about something more than filling a warehouse with critically respected and beautifully designed books, most of which didn’t sell. I was hungry, I might even say desperate, for meaning in my life. My answer to that hunger was to leave home and go to seminary and on to parish ministry. I traded a life given to filling a warehouse with mostly unsold books for a life given to filling notebooks and file folders with mostly unheeded sermons. But once in a while something happens, somebody seems to get it, at least I seem to get it, and my trust is renewed that there is meaning in who I am and what I do. Not everyone needs to leave home and job and family to find meaning in life. There was that fellow, unspeakably desperate to be healed, whom Jesus restored to health and who begged that he might be allowed to travel along with Jesus and the other disciples. But Jesus refused, saying, “Go home to your friends, and tell them how much the Lord has done for you, and what mercy he has shown you” (Mark 5:1-20). Sometimes a life of discipleship takes us elsewhere; most of the time it sends us right back to where we’ve been, but with a different message to relay, a different story tell, a different life to live. If the seeds of discipleship are sown in desperation, the fruit of discipleship is borne in serving Christ’s mission in the world. God did not make an apple tree to produce an apple; the real product of an apple tree is another apple tree. The apple is merely the means of creating another tree. And God does not make us disciples to make our lives better; God makes disciples in order to make other disciples so the life of the world will be better. 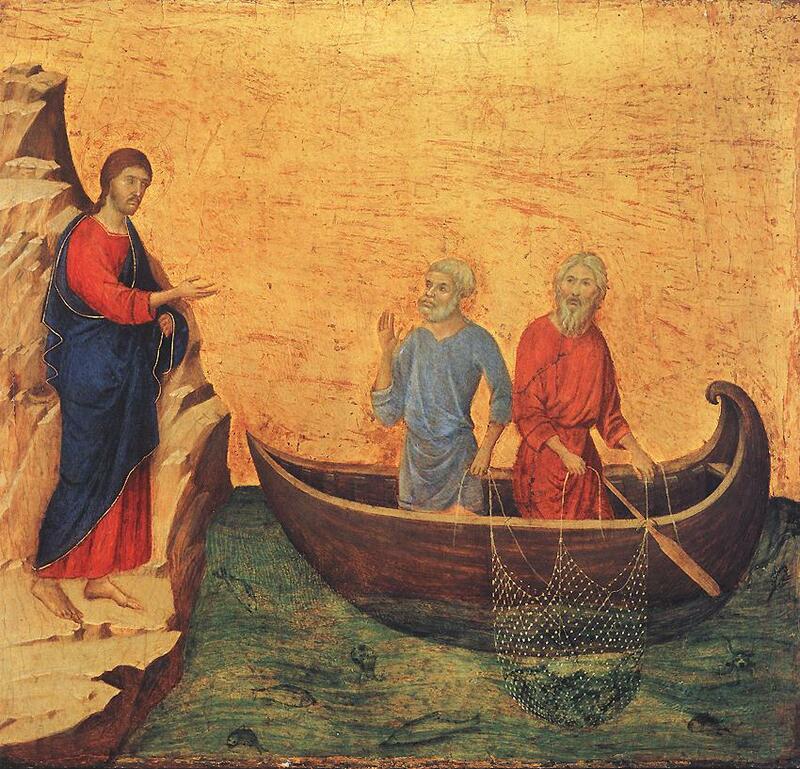 “You did not choose me,” Jesus tells today’s disciples as he told his first disciples, “but I chose you. And I appointed you to go and bear fruit” (John 15:16). God calls us to be disciples of Jesus not to save us from what every other person experiences but to give us a job to do. Disciples are commissioned by God to be the body of Christ in the world, carrying on Christ’s ministry of reconciliation and restoring the perfection and original integrity of creation. “The mission of the Church is to make disciples of Jesus Christ for the transformation of the world” – that’s the way our Book of Discipline describes why we are here as United Methodists.2 “As servants of Christ,” it goes on to say, “we are sent into the world to engage in the struggle for justice and reconciliation . . . to reveal the love of God . . . and to demonstrate the healing power of the gospel with those who suffer.”3 It’s the work of Christ in the world, and it’s the work in which every disciple has a share. A lot of church members, maybe a majority, are “almost Christian,” good people who have not experienced the birth “from above” that lets them see the kingdom of God in our midst (John 3:3). Some church members, and you may know a few, are “altogether Christian.” They have placed their “sleeping, eating, going-to-work and walking around lives” before God as an offering and fixed their attention entirely on God, and they are being changed from the inside out (Rom. 12:1-2 The Message). Then there are the rest of us – I pray I’m one of them – who are working out their salvation “with fear and trembling,” trusting the grace of God who is at work in us (Phil. 2:12-13). notes — 1. John Wesley, “The Almost Christian,” The Works of John Wesley, vol. 1, ed. Albert C. Outler (Nashville: Abingdon Press, 1984), 131-41. ▪ 2. The Book of Discipline of The United Methodist Church, 2012, ¶ 120. ▪ 3. ¶ 124.